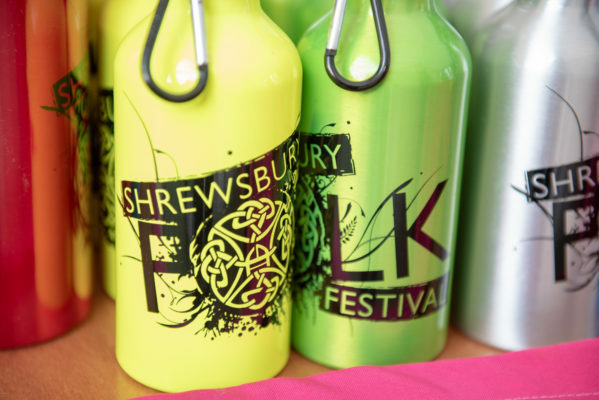 Shrewsbury Folk Festival – looking after where we love to be! Making Shrewsbury Folk Festival as sustainable as possible is a key priority for us – please join us in our quest to reduce waste to landfill and look after where we love to be. 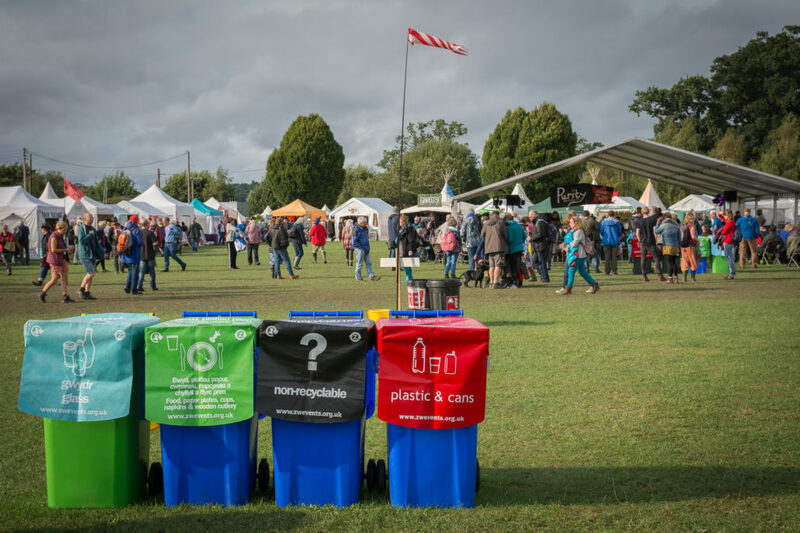 With your help, we recycle the majority of the plastic, cans, glass, cardboard, paper as well as food waste generated at the festival. This year we hope to build on our success to achieve even better separation and to send even less waste to landfill from the festival. We are working very hard with particular regard to recycling and the elimination of single use plastics. We aim to minimise the single use of plastic wherever possible and specifically water bottles so, since 2018, we no longer provide bottled water. Please bring your own reusable drinking container that can be filled from the numerous water points. Recycled stainless steel enviro pint cups and aluminium bottles will be on sale in our Merch tent in the main arena. There is also a drinking water fountain on the wall outside the stewards office – all water points are detailed on our site map. If you wish to use glitter, please ensure it is biodegradable and please don’t use balloons on site. At your camp – think ahead and keep your recycling separate from your rubbish. Maybe bring your own recycling box with you or use one of the ZWE sacks to carry your recycling to the bin points. There will be a paper/newspaper recycling point at the festival shop. If you are bringing a dog with you, please bring bags and use the dog poo bin near gate 2 rather than the recycling bins. It upsets our recycling team – thank you!! The ZWE HQ for the festival will be next to the river in the livestock sheds behind The Studio – if you have any questions, please pop over to have a chat. And if you’re camping nearby, take them your rubbish and recycling. Moongazing Hare Bars runs a reusable cup system – you pay a deposit which is refunded when you return it. Cups are washed and reused. You’re welcome to use your own tankard! We will no longer supply water in plastic bottles and are replacing individual plastic milk pots with stainless steel jugs. Our food traders are asked not to use disposable polystyrene and plastic plates, cups and cutlery, and plastic straws, and to minimise the use of pizza and other food boxes where a simple bowl, plate or tray will suffice. The Food Hub will collect surplus food that will be distributed to groups including the Shrewsbury Ark, the food bank, the hospice, breakfast clubs and church groups. Any useable camping or other equipment that is left behind is donated to local charities.